Anything that exists physically and has mass is defined as matter. For example your water bottle is matter and so is the water in it. However, the laziness you feel in the morning or thoughts you have in your mind are not matter because they are neither exist physically nor do they have mass. Now that we know what matter is, we can add to this by saying that there are four states in which matter exists. These are plasma, solid, liquid and the gaseous states. The last three are the basic or conventional states of matter. Almost anything that is classified as matter can be converted into any of these three states as long as certain conditions are met. These may include changes in pressure, temperature etc. Note that although almost all matter can be converted from one state to the other, at room temperature it takes some particular state. For example H2O is the chemical formula for water that exists in the liquid state at room temperature but can also become ice (solid state) or steam (gaseous state). 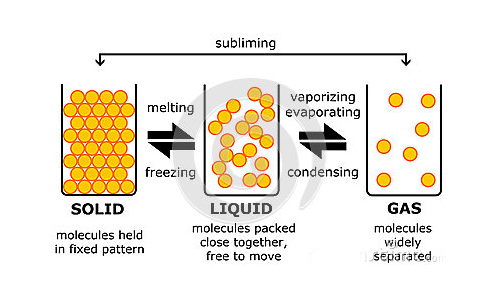 The difference between the liquid and the gaseous states is at the molecular levels, that is, due to different characteristics of the molecules of which they are composed of. Any liquid is made up of tiny particles that vibrate at or in close proximity to their original positions. The particles are held together by intermolecular forces. A given mass of a liquid has a fixed volume, that is, the region is occupies remain fixed. If you pour a liquid in a container, then the liquid will occupy a region that is equal to its volume. This is not true for matter in the gaseous state. The tiny particles that make up any gas are free to move. They can move around anywhere randomly and the forces of attraction between these particles are very low. They are lesser than the forces in a liquid and therefore the motion of a gas is referred to as random motion whereas a liquid’s motion is known as a flowing motion. Moreover, the volume of a gas, is not fixed unlike a liquid. Since the particles are in a random motion, they are free to move anywhere they can. Therefore, the gas will take the volume of the container. This means that if any gas is enclosed in a container it will have the same volume as that of the container. The particles will spread and occupy as much region as they can. If the same amount of gas is then shifted to a larger container, the gas particles will then occupy a larger volume. The volume has hence increased. Therefore, it is safe to say that the volume of a gas is not fixed. Owing to weaker forces of attraction, the particles have great spaces between them in the gaseous state. In contrast to this, the particles in a liquid have relatively lower space between them. This is also the reason for the fixed volume of a liquid as opposed to a gas. The energy of the particles is another area where a gas and a liquid are different. The energy of the particles also determines the spaces between them and hence the state of the matter. The particles of a gas have the greatest energy of the three basic states. Therefore, the particles show great movement and therefore spread as much as they can. The particles of a liquid, however, have lower energy than those of a gas. Therefore they usually remain in close proximity to their initial positions as long as other conditions remain the same. allana. "Difference between the liquid state and the gaseous state." DifferenceBetween.net. November 6, 2014 < http://www.differencebetween.net/science/difference-between-the-liquid-state-and-the-gaseous-state/ >.